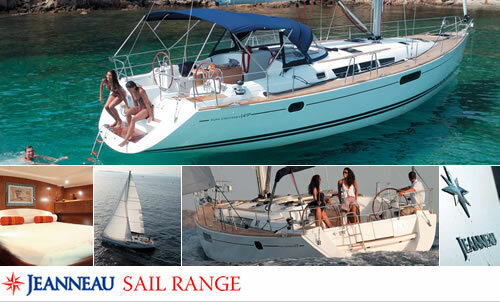 Jeanneau has been developing perfecting and pioneering the sail boat industry since the 1960s, making the company an early innovator and highly experienced player in the boating industry. This is all reflected in the crafting of their sail boats that push the boundaries of modern engineering and boat building techniques, illustrated through their numerous patents and world class end products. The team at Jeanneau sees cooperation between some of the highly regarded and innovative designers and engineers within the boating industry. The Jeanneau brand and all its developments are considered to be some of the best boats, boating equipment and service care in the world. Thanks to its wealth of experience and expertise, the company has won the French manufacturer numerous awards in standards and excellence for helping to produce some of the finest boats in the world today. The sail ranges help exemplify its prowess and attention to detail, allowing the company to carry five fantastic sailboat lines. The company constantly refines its concepts to ensure that the final product is one that they can be incredibly proud of, keeping its range of boat ahead of the competition and at the pinnacle of innovation. The Odyssey Deck Saloon series has now become an integral part of the Jeanneau company, with its boats in this line becoming more and more popular, thanks to its sophisticated design that allow for not only a beautiful looking boat, but for one that is spacious, comfortable and provides incredible performance on the water. The Sun Odyssey DS range is one to investigate before deciding on your new boat. The Sun Odyssey series has been evolving year in year out to what it is today, where the range offers a number of fast, comfortable cruising and performance yachts. Jeanneau have designed not only the way the boat travels through water in this series, but also with its inside designs that cater for your every need while aboard a sail boat from the Sun Odyssey range. These boats are available at affordable prices and are often considered as a boat from your dreams. With Jeanneau’s Sun Odyssey Performance sail boats you can expect fast cruising with luxurious comfort offshore, which is often the complete package when it comes to the ideal boat for a new or existing owner. Below decks are comfortable, functional and versatile, making this a member of this range your perfect next boat. The Sun Fast range includes a number of the boats tailored towards racing, with sailing boats that have won races, awards and trophies over the years. The sail boats in this range are designed and produced to keep the Jeanneau boats ahead of the game, meaning they truly are at the pinnacle of the sail boat industry.